River, just off the rail trail. We didn't have to be out of our cabin today 'til 10AM, so we decided to take full advantage and sleep up until 9:30. We ate light breakfast and hauled our bikes back down the torturous gravel trail we had come up the night before. It wasn't until 11 that we reached the rail trail, since we had taken our time getting everything together. The trail, we learned, stretches all the way from Pittsburgh to D.C. and was already teeming with short run tourists, families on day rides, joggers, dog-walkers, and anyone looking to get a quick walk or ride in during their day. Our late start didn't spur us on any faster, we kept a steady, easy pace until Connellsville where we had a pretty mediocre lunch at the Valley Dairy Diner, and had our bikes looked over at the local bike shop. Ben had his spoke fixed for good and got some new tires while I found out the source of my bike's ailments and everyone else picked up odds and ends they needed. With the day already well past noon, we had only gone about 16 miles. At first, we tried to quicken our pace a little to make up the time, but when we realized that we really had no good options for lodging for the night, we settled on just calling it a day after 40 miles at one of the rail trail's free campgrounds- which are really, really nice when you're on the road. It has been astounding to me how much free camping we've been able to do, and how much un-utilized space there is in the world despite the seemingly endless sprawl. Churches, we've discovered, are for the most part vacant except for one or two days a week. Also, every time we've run into someone at a church, they have have been very nice and welcoming. State parks are usually cheap if you're not trying to park an RV and the "primitive" sites have everything you really need. City and county parks are free if you're crafty, and have water and electricity if you're lucky. Anyway, once we settled in we had a tasty dinner of campfire cooked pizza, some cous-cous, and hot cocoa while we warmed around the fire. The way this relates to the rail trail is that when we were climbing the mountains of Pennsylvania, all we could do was curse the road, the sun, and the geography of the state, but when we were on the rail trail, peddling incessantly but flying through the miles with little resistance, all we could do was curse the trail, its featurelessness, and the lack of roadside distractions. I had made a run to the store the night before, so we had eggs and bacon for breakfast instead of oatmeal. Today, we all knew, was a very special day. It was Christmas. After breakfast, we rushed to get the campsite cleared out because we wanted to get to Houston, PA before the post office closed. Houston, as those wonderful folks who sent cards and packages know, was the location we had designated as our first mail drop. We motored through the last bits of the rail trail, and found ourselves once more riding on the familiar, crowded, shoulderless roads of Pennsylvania. We stopped at a Sheetz (similar to Wawa) for second breakfast/lunch and made the last of the 36 miles total we had to go from camp to Houston disappear as fast as we could. When we arrived in the post office of the small, somewhat rundown town of Houston, one of the first buildings we saw was the low, square post office building a stone's throw from the railroad track. After we'd entered and Mandi told the woman behind the counter that we were here to pick some things up that had arrived general delivery the woman's face lit up and she exclaimed, "So you're the general delivery lady! I hope you brought a truck!" 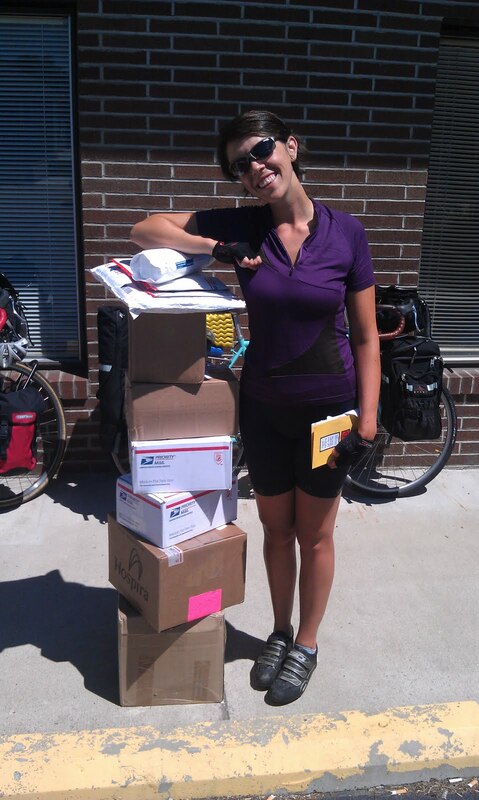 When we told her no, we'd only brought bikes, she said that she then would just give us the lightest of the parcels and proceeded to grab a couple envelopes and a small box. We had to explain that we did, in fact, want everything, and this sort of blew her mind. She shrugged and then brought it all out. We took one look at the boxes and all immediately had our doubts about our ability to carry everything, but this was tempered by our excitement to see what we had gotten. We had our gift opening outside in the post office under the blazing sun and the bemused scrutiny of the locals making mail drops. We want to make special thanks to everyone who sent us something. Thanks to my sister, Jeanna, brother-in-law Will, Mom and Dad for all the goodies, thanks to Erin's Mom, sisters Emily and Ashlyn, aunt, uncle and cousins, Joan, Philip, Erik, and Ferne for the well-wishes, food, and pillow cases, Erin's Mom's friend Linda for the amazing cookies, thanks to Ben's Mom, Pat, and sister for his stockpile of snacks, Elise, and Ben's friend Drew for the Magic cards, and thanks to Mandi's Mom for birthday water shoes and friend Ashley for the candies and candles. It means alot to us that you all are following our progress and took the time to send us the care packages we received. It's very touching to be in such unfamiliar surroundings but the beneficiary of so much love and good will manifested so tangibly. We packed up all of our presents after a long while of sorting and opening (and eating), then moved on along our journey. We also wanted to make the town laundromat a priority for the day. While we did laundry, we were attracting wild characters like flies. A rogue's gallery of townspeople stopping in do wash kept us busy in conversation for the couple hours that we sat there. Eventually, Ben and Mandi slipped away to the bar for a quick beer while I sat alone on the bench trying valiantly to write the blog with one man telling me all about the history of the Darr Mine Disaster of 1907 ( I could recite so much about this here, but will refrain), another telling me about his 5 Superbowl and Championship rings as the Steelers' clubhouse manager and his bum luck at now owning the strip mall and dealing with his lousy, no-good renters, and yet another old codger going down the list of problems with the government, the locations of each of his 17 children (15 with one woman, 2 with another, lived 25 years in Georgia, 22 in Wyoming, married at 19, plans to mountain bike the Appalachian Trail at the end of the month at age 75), and anything else. Everyone was very good natured and affable, but I wasn't unhappy when it came time to politely duck out and mount up on the bike. From there we were determined to still get at least our 50 miles in, but wanted to go further if we could, because the end of S Trail and Pennsylvania were within our grasp. The very last town on the S Trail was our aim for the day, West Alexander. We were planning on staying at the Fairgrounds that are right on the edge of this tiny little border town, just inside of Pennsylvania. However, Ben and Mandi missed the turn for the park and ended up in West Virginia, just a mile or two away. It's a good thing they did, because when they were scouting the town for alternative accomodations, a 10 year old little boy told them they should just stay in the town's Presbyterian Church. The church, he said, was open to everyone who wanted to go in. For us, this seemed like living in luxury, so we decided to tentatively move in. The church was quiet and roomy, and we had just gotten our things stashed in the basement when a car pulled up to the rear of the church. Erin, who was on te phone at the time, nearly panicked, thinking we were going to offend someone by hanging out in their church. Luckily for us, it was Jane Noble, clerk of session for the church and champion do-gooder who had just driven up. Jane not only welcomed us warmly, but said a prayer for us on the spot and even offered to drive us to dinner. We declined the latter, and instead walked to a diner in town, leaving Jane to work on making potatoes for a hundred people for some church function. When we returned, Jane was just getting ready to leave, but informed us she had gotten her daughter-in-law to drop off some pastries and juice for our breakfast. Jane also told us were welcome to use the church's kitchen to make eggs and bacon for ourselves in the morning. We were awed, and very grateful. We were also very happy to sleep indoors; we set up our sleeping pads in the carpeted pre-school room and passed out. When we woke up today, we made coffee in the church's kitchen to go with our orange juice, eggs, and bacon. Jane had also left us silverware in blue and pink napkins- two for the boys and two for the girls- each tied indiviually with a ribbon. Thanks so much for your kindness and consideration, Jane. West Alexander would have been just another small town in a litany of small towns, but now we'll remember it for the kindness we were shown instead of the night we spent camping in the park hoping the cops didn't come by. West Virginia, we hardly knew ye. Very shortly after leaving town, we entered the northern pan-handle of West Virginia. Not surprisingly, the roads didn't miraculously improve as soon as we crossed the border. Instead we just had a few short miles of familiar bumpy riding before we reached the city of Wheeling, WV which is right on the Ohio River, the border between Ohio and West Virginia. Wheeling was a very depressing town, a town that like so many others we've seen on our trip has been left behind by industry and the economy. It reminded me of Connellsville, in PA. A man on the rail trail told me the town used to have six railroads, but not only had the one. At least in Pennsylvania (we learned this just recently) there is a huge boom in the energy industry as a huge amount of natural gas has been discovered in the state's shale beds. This town, however, didn't have even the slightest whiff of resurgence. We rode a pleasant bike path by the highway into town, but it was dotted by small, ratty homes jammed up against the interstate and many working age folks wandered aimless-seeming around town on the Friday afternoon we passed through. The downtown had a hollowed out feel to it, and we crossed a couple of rusted out bridges to cross into Ohio, glad to be moving on. Our first stop in Ohio was lunch at Subway, where we escaped the mid-afternoon heat for an hour or so and plotted our course. As far as we could tell, there were a lot of big rollers to climb, a scalding hot day to do it in, and not many places near by for us to stay. The only thing that caught our eye was a spot called the Barnesville Guest House 25 miles away in Barnesville, OH. We decided to give the number listed a call, just because the online ad mentioned camping and rates around $10. The man, Sam, that we talked to apparently lives currently in San Francisco and administrates the property remotely himself and through his aunt who lives locally. When we asked about rates, he told us we should just leave whatever payment we felt we could afford in the guestbook, and that we would most likely have the huse to ourselves. We were a little confused by what kind of place exactly we'd be staying at, and the arrangement altogether. However, when we arrived, we realized we'd hit the jackpot. Sam had given us the code to the front door so we could retrieve a key, and when we entered the house we were delighted. The house is furnished like your grandmother's house. There's an ancient refrigerator sized Zenith radio by the front door, a record player, doily clad tables...the works. The comfy feel of the place, and the thunderstorms in the forecast immediately sealed the deal- we decided that instead of camping out behind an empty house we would move right in, and even stay an extra day. We grilled some burgers, had a few beers, watched PBS for a little while, and generally hung around the house. It's amazing, but I suppose not unexpected, that despite, or because of, all our travels we leapt at the opportunity to stay in a house for our day off. We eschewed the bedrooms for our sleeping pads on the living room floor, but slept like stones. Today we're lounging around in the house in Barnesville. We've got a chicken in the oven, beers in our hands, and a John Denver record on. Things are just fine for us today. We'll be sure to report anything that pops up. Thanks for reading and watch the tumblr for picture updates today. I love reading about all the people you guys meet and talk to, def one of the coolest parts of the trip as someone from the outside looking in. It's so awesome you guys get to really get a feel on so many places in America, and unfortunately many depressed places. When I visited Ohio, I felt the same way. Truly awful. Maybe presidential candidates should bike tour around the US to really get a feel for what it's like out there! Oh oh, sounds like granny's house in Barnesville could be the end of the road. That John Denver and roast chicken has a soporific effect, you know. I love seeing how methodically you are ticking off the miles! You guys rock.